A new species of dinosaur found in the Egyptian desert is shedding light on Africa's missing history of dinosaurs. Few fossils have been unearthed from the last days of the dinosaurs, between 100 and 66 million years ago, on the continent. Scientists say the dinosaur, which lived about 80 million years ago, is an "incredible discovery". The giant plant-eater was the length of a school bus and weighed about the same as an elephant. It had a long neck and bony plates embedded in its skin. The dinosaur's fossilised remains were unearthed during an expedition by palaeontologists from Mansoura University in Egypt. Named Mansourasaurus shahinae, the new species is regarded as a critical discovery for science. 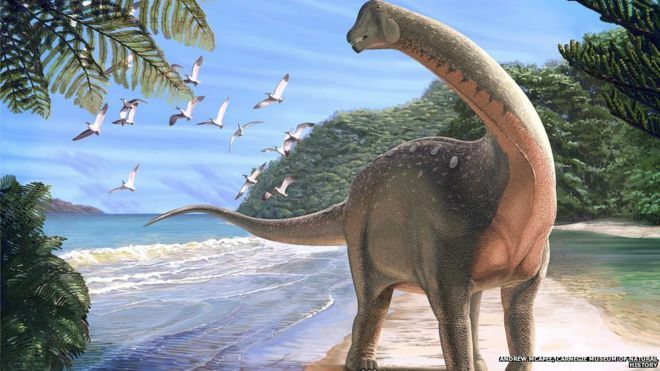 "It was thrilling for my students to uncover bone after bone, as each new element we recovered helped to reveal who this giant dinosaur was," said Dr Hesham Sallam of Mansoura University, who led the research.